I arrived a little early for the Tori Amos concert in the Chicago Theatre last Tuesday and therefore I spent quite some time exploring the building. Built in 1921, originally intended as a motion picture venue and initially known as the Balaban and Katz Chicago Theatre (or, significantly, ‘the Wonder Theatre of the World’), it had been designed mainly by Cornelius W. Rapp and George L. Rapp. With an impressive auditorium of 3,880 seats, majestic staircases and countless ornaments, the theater is the oldest surviving representation of the Neo-Baroque French-Revival style in Chicago. It’s listed as a Chicago Landmark, while its characteristic marquee is deemed an unofficial emblem of the city. 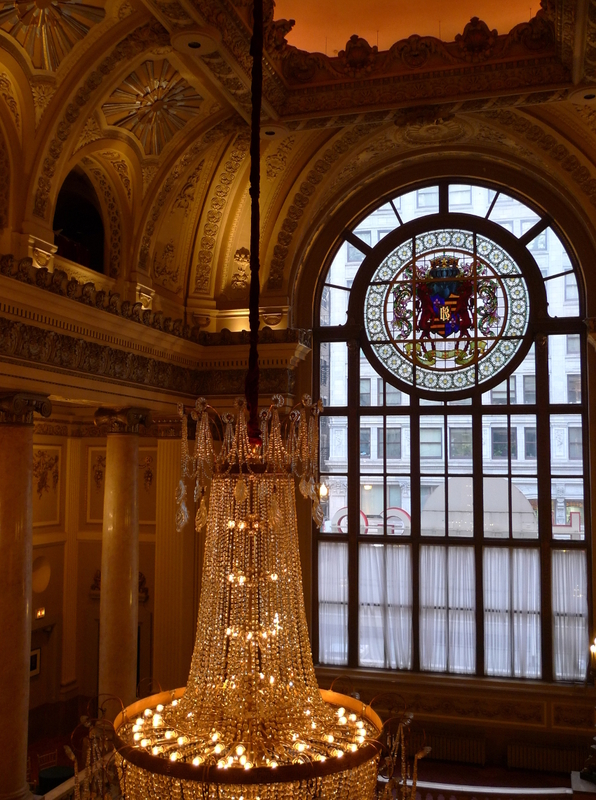 Here you can see the massive chandelier in the lobby, as seen from the third floor, along with a grand window in which is set a glass panel bearing the coat-of-arms of the Balaban and Katz theater chain (two horses holding ribbons of 35-mm film in their mouths), and a tiny fragment of ever-color-changing glass ceiling, here displaying a wonderful peach hue. You can find a more detailed photograph in which the ceiling takes on celestial blue on my Facebook page. This entry was posted in Bits & Pieces, Chicago, Chicago Theatre, Loop, Tori Amos, Travel and tagged Bits & Pieces, Chicago, Chicago Theatre, The Loop, Tori Amos, Travel. Bookmark the permalink.